Representative Avery Bourne (R-Raymond) is pushing legislation that will pick up where Senate Bill 1 failed downstate school districts, skewing school funding to first drive money to one school district – Chicago. 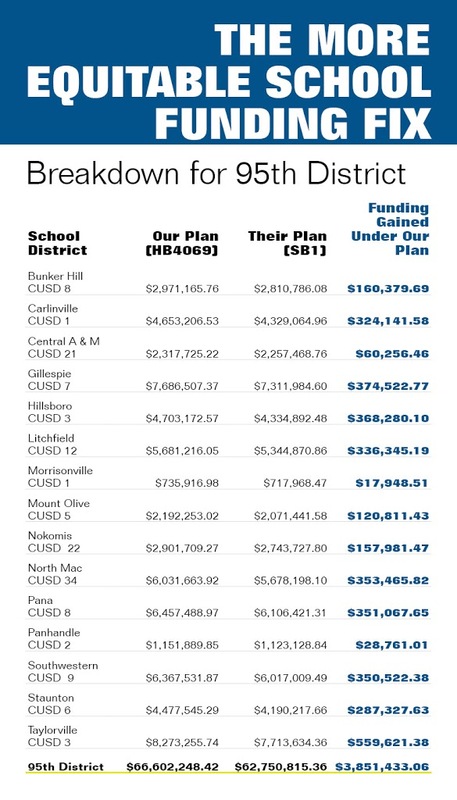 Bourne is a Chief Co-Sponsor of legislation, House Bill 4069, that is an attempt to restore truly equitable funding through a restructured school funding formula that drives more funding to low-income students and to school districts that need it most. Bourne’s bill was drafted from agreed language in SB 1 before an amendment was added to bail out the Chicago Public School System. House Bill 4069 incorporates the agreed upon evidence-based model while treating all 852 school districts the same. It also ensures that no districts lose money and creates real equity in the school funding system for every student across the state. Following the proclamation by the Governor, the General Assembly has been called back to Springfield to be in special session June 21-30. These ten days give the legislature the opportunity to reestablish school funding reform discussions and ensure that reforms are passed that provides fair and equitable funding for all children in Illinois regardless of zip code.